Lithium is a naturally occurring metal discovered in 1818. In late 1800s it was noticed to contain mood stabilizing properties. John Cade, an Australian psychiatrist founded in 1949 that lithium was useful for treating mania or elation. It was also found to be efficient in preventing habitual biological mood swings. John Cade was the first to publish a paper on the use of lithium in the healing of acute mania. It is the positively charged ion of lithium which is medically effective. The use of lithium was not approved for use by The U.S. Food and Drug Administration until 1970. Lithium is a natural element used to cure mood swings. You cannot get addicted to it, nor get withdrawal symptoms when the dosage is stopped. If a person feels unwell after stopping lithium, it generally means that a few of the symptoms related to the mood which were effectively treated by lithium are re-emerging. Lithium also does not lose its effect with time. Some of the most widely used brand names of lithium Eskalith, Camcolit, Lithobid, Liskonum, Li-liquid, Priadel liquid and Priadel tablets help in reducing the frequency and severity of mania. They also help to ease the bipolar depression. It affects in many stages in the process by which the nerve cells communicate with each another. Usually lithium takes about one or two weeks to begin working. Before starting the Lithium therapy, it is recommended to have a blood test done. The tests are required to review the state of the kidneys and the thyroid gland. An under-active or over-active thyroid gland may lead to symptoms that resemble depression or elation. Kidney tests are done to check whether the excretory mechanism of the body is working properly or not. If the excretory system is not working properly, it will not be able to eliminate the lithium. So prescribing lithium to the patient may not be possible. During treatment the doctor may suggest drinking 8 to 12 glasses of water a day and using a normal quantity of salt in food. Both water and salt can affect the lithium level in the blood, so it is important to have a fixed amount every day. Lithium tablets when taken by mouth get dissolved in the stomach into small particles and pass into the blood. The blood stream carries it to every part of the body including the brain. Lithium escapes through the kidneys into the urine. Sometimes the lithium gets accumulated in the blood stream due to a slow filtering process. The blood tests show the amount of lithium remaining in the body. A high amount of lithium may produce unpleasant and serious toxic effects. So anyone taking lithium requires a blood test. The doctor will decide the dose based on the efficiency of kidneys in excreting lithium and the type of mood disorder you are having. About 75% of patients taking lithium suffer from some minor side effects. These side effects can include fever, hand tremor, acne, hair loss, nausea, sedation, vomiting, slurred speech, drowsiness, fainting, diarrhea, poor concentration, confusion, weight gain, impaired memory, unsteady walking, muscle weakness, decreased thyroid function, rapid heart rate, increased urination, increased thirst and much more. However they become less problematic after some weeks as the body adjusts to the drug. Sometimes the side effects can be eased by tweaking the dosage. However, never change your dose or brand of the drug on your own. Check it with your doctor first. Some serious risks with lithium include weakening of bones in children, kidney damage, thyroid problems, birth defects while pregnancy. It might not be suggested for women to take lithium while breastfeeding. 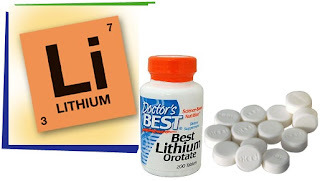 Lithium can interact with some medicines, and not everyone can be given a lithium therapy. Talk to your doctor for supplementary information. Make sure your doctor knows about history of allergies, epilepsy, cancer, heart diseases and kidney disease. Tell your doctor about all the medicines you are taking. Avoid alcoholic beverages and products containing sodium. Be cautious while driving or using machinery. By chance if you miss a dosage of lithium, take it as quickly as you remember it unless the next scheduled dosage is within two hours. If so, miss that dose and resume the usual dosing schedule. Never "double up" the dosage to catch up.